A native of Anderson, Indiana, Carlton Smith from an early age has shown interest in history and music, along with demonstrating mechanical and artistic abilities. Throughout his academic years, Carlton pursued education and training within the areas of fine arts and industrial arts. Starting in 1973, he enrolled at Ball State University working toward a Fine Arts teaching degree. Theatre pipe organs became an interest in 1974 when he was asked to lend his abilities to work on the Page pipe organ in the Anderson (IN) Paramount Theatre. With this request, Carlton became a member of the Paramount Organ Society, a local not for profit group. In addition to restoration work on the Page organ, he also has shared organ performance duties at weekend intermissions with Dr. John Landon into the mid 1980s. 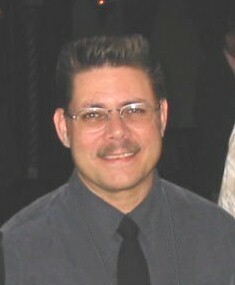 Carlton moved to Indianapolis in 1976 to work for the Heaston Pipe Organ Company and Heaston Productions, a theatre exhibition company. When the organ company was closed some years later, Carlton moved to the parent company, Heaston Productions as a carpenter and eventually moved up to Buildings Operation Supervisor, a position he held until 1988. During the years as an employee with Heaston, his theatre organ maintenance and restoration pursuits continued. Through his profession Carlton met members of the Paramount Music Palace management in 1977 who later hired him in 1983 as their organ technician and continued that until 1994 when the business closed. During this time, Carlton also worked for a short period as shop foreman for the J.K. Aikman Company where he was responsible for most of that company’s theatre organ work. 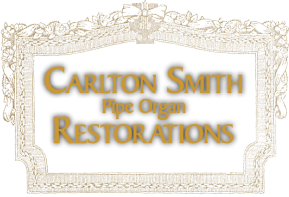 In 1990, with encouragement from many friends and professionals, he decided to establish Carlton Smith Pipe Organ Restorations - a company solely devoted to theatre pipe organ preservation. He has since become known internationally as a high-quality restorer of historically sensitive installations and art-case consoles and has led or played a key role in the restoration of theatre pipe organs in his native state of Indiana and throughout the United States. Recognition of his craftsmanship came at the 1992 Philadelphia ATOS Convention when he received the American Theatre Organ Society’s Technician of Excellence Award. Carlton has always cherished this honor, particularly since his peers and theatre organ musicians with whom he has held friendships for many years presented the award. Carlton has been a member of the Central Indiana Chapter of the American Theatre organ Society since 1974, holding offices of president and vice-president numerous times. Additionally, through Carlton Smith Pipe Organ Restorations, he has played a key role in restoration, installation and maintenance of the many of the commercially owned theatre organs in the Indiana area and CIC-ATOS owned organs in Indianapolis. Taking the theatre organ very seriously as a musical instrument, he has devoted a large portion of his life to the study of this musical art form. Carlton is extremely interested in the preservation of the theatre organ as an original American musical invention. He collects historical theatre organ factory blueprints as well as general manufacturing data and plans. In 2002 he was elected to the board of Directors of the American Theatre Organ Society where he served until 2008 and again was elected in 2014 holding directorship to present. He is the Chair of the Technical Committee as well as Young Organist Scholarship Committee of that organization.